Other than Tyler Kennedy's Sidney Crosby impersonation and the killing of George Laraque's five-minute major, this photo has to be the high point of last night's 7-3 Penguins victory over the Sabres. Priceless comedic value aside, I still don't understand why some Penguin fans hate Jagr so much. Other than the famous "dying alive" comment, I have mostly good memories of the mulleted future Hall of Famer. The Pens moved into a tie with Montreal for first place in the East, and there's even more good news on the way: both Crosby and Marian Hossa are expected back in the lineup for the Sunday showdown with Philadelphia. For any of you attending, I encourage you to go get your 68 jersey out of the mothballs and customize it as illustrated by the male model shown above. The "Dying Alive" thing was B.S. at the time and angered practically every Penguin fan you could ever ask, but in time it's become laughable. I look back on the Jagr years very fondly. He is the clear cut #2 player in team history (for now, Sid). He'd be the #1 guy for many franchises. That said, this jersey is pure genius! I saw this guy at the Pens-Rangers game at MSG in November. I wanted to go and shake his hand, but I was in the nosebleeds and he was down below. The Rangers fans sitting around me where perplexed about why we hate Jagr so much. I just told them that they'd never understand. 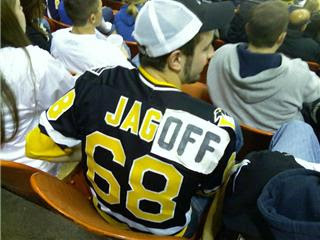 Also, I don't think the New Yorkers knew exactly what jagoff means, but they eventually figured it out. Not the first time I've seen this. A guy in a Pens jersey was put on the jumbotron at the Caps game on Sunday - to scattered boos from the Caps fans & cheers from the Pens fans - then when he showed the back of the jersey, he got cheers from both sides. I've actually seen someone take this to the next level and have a custom made #68 jersey with the name 'Jag-Off' sewn in on the back. I still have an old Jagr jersey with "Pittsburgh" diagonally across the front. When the Pens changed jerseys in the early 90s, those were the only ones that were any good IMO. I remember Jagr's years in Pittsburgh fondly, but what he did still pisses me off. It seemed to go downhill when he lost the mullet. Put it this way: Mulleted Jagr = Good. Non-mulleted Jagr = Bad. What really makes this jersey is that its like a replica of a replica. I mean, look at those iron-on numbers. And they're the wrong font, too. That was $49 at J. Natale's at Century III Mall back in 1992.